Imperial Tombs of the Ming and Qing Dynasties hold the royal remains of emperors from the Ming Dynasty (1368-1644) and Qing Dynasty (1644–1912). Emperor Yongle (1402-1424), the third emperor of the Ming Dynasty and the first emperor interned, designated the location of the Ming Dynasty Tombs. Si Ling was the thirteenth and last emperor laid to rest in 1644 C.E., in the closing years of the Ming Dynasty. Emperor Yongle employed the practice of Fengshui to locate the imperial tombs in an auspicious place, protecting Beijing from evil spirits, powerful winds, and invading armies from the north. The Ming imperial tomb area occupies 40 square kilometers (15 sq mi), patterned in an arc-shape at the foot of the Jundu Mountains south of Beijing. The Ding Ling tomb of the Wanli Emperor remains the only Ming Tomb excavated in the complex. The Imperial Tombs from the Qing Dynasty, the Western Qing Tombs, and the Eastern Qing Tombs, are well-preserved and constructed using the principles of Fengshui. In the Western Qing Tombs, Emperor Yongzheng's tomb Tai Ling, the first emperor was interned in 1737 while the ashes of Aisin Gioro Puyi, the last emperor, were not interned until 1998, long after the end of the last dynasty in China. The Eastern Qing tombs serves as the center piece of the complex. They include the tombs of Emperor Shunzhi (1638-1661), the first Qing Dynasty emperor to rule China, Emperor Qianlong (the fourth emperor of the Qing Dynasty), and Empress Dowager Cixi, the last Empress Dowager of China. In 2000, UNESCO designated the collection of tombs and burial complexes a World Heritage Sites, making additions in 2003 and 2004. The main Ming Dynasty tombs, which were designated in 2000, are located at Xianling, Zhongxiang, Hubei Province. 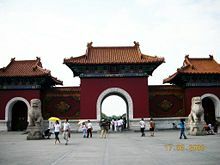 In 2003, UNESCO extended the the designation to include the Ming Xiaoling Tomb Nanjing City, Jiangsu Province, and Ming Tombs in Changping District, Beijing. The Qing Dynasty tombs include those of the Western Qing tombs located in Baoding, Hebei Province and the Eastern Qing tombs located in Zunhua, Yixian County, Hebei Province. In 2004, the designation extended to include The Three Imperial Tombs of the Qing Dynasty in Liaoning; the Yongling Tomb (Fushun City), the Fuling Tomb (Shenyang City), the Zhaoling Tomb (Shenyang City), all in Liaoning Province. Standing in the Spirit Way at the Ming Tombs looking back towards the entry gate. The Ming Dynasty Tombs (Chinese: 明朝十三陵; pinyin: Míng cháo shí sān líng; lit. Thirteen Tombs of the Ming Dynasty) are located some fifty kilometers due north of Beijing. The third Ming Dynasty emperor Yongle (1402-1424), who moved the capital of China from Nanjing to the present location of northwest Beijing, selected the site. The Ming tombs of the thirteen emperors of the Ming Dynasty sit on the southern slope of Mount Taishou (originally Mount Huangtu). emperor Yongle planned the layout of the ancient city of Beijing. 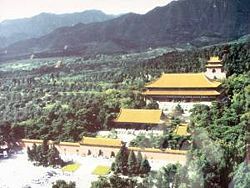 After the construction of the Imperial Palace (the Forbidden City) in 1420, the Yongle Emperor selected his burial site and creating his own mausoleum. Thirteen Ming Dynasty Emperors were buried in the Imperial Tomb area. The tombs of the first two Ming Emperors are located near Nanjing (the capital city during their reigns). 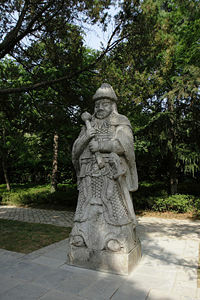 Emperor Jingtai, denied an imperial burial by Emperor Tianshun, was instead buried west of Beijing. Si Ling, the last Chongzhen Emperor, had hanged himself in April 1644. His tomb is constructed on a much smaller scale than his predecessors. In that same year, Li Zicheng's army pillaged many of the tombs before advancing and capturing Beijing. The sites for the Ming Dynasty Imperial Tombs had been selected using Feng Shui (geomancy) as a way of prohibiting evil spirits and destructive winds from the North. An arc-shaped area at the foot of the Jundu Mountains north of Beijing served that purpose well. The forty square kilometer area, enclosed by the mountains in a pristine, quiet valley full of dark earth, tranquil water with met the requirements of Feng Shui. "Spirit Way," a seven kilometer road enters the complex through a wall that surrounds the tomb complex. The "Great Red Gate," a large, three-arched gateway, painted red, and called, serves as the main gateway. As of 2008, the public has access to three tombs: Chang Ling, the largest (40°18′5.16″N 116°14′35.45″E﻿ / ﻿40.3014333, 116.2431806); Ding Ling, whose underground palace has been excavated (40°17′42.43″N 116°12′58.53″E﻿ / ﻿40.2951194, 116.2162583); and Zhao Ling. There have been no excavations since 1989, but plans for new archeological research and further opening of tombs have been made public. Ding Ling (Chinese: 定陵; pinyin: Dìng Lìng; literally "Tomb of Stability"), the tomb of the Wanli Emperor is the only Ming Tomb excavated in the complex and the only imperial tomb excavated since the founding of the People's Republic of China. The excavation of Ding Ling began in 1956 after a group of prominent scholars led by Guo Moruo and Wu Han began advocating the excavation of Chang Ling, the tomb of the Yongle Emperor, the largest and oldest of the Ming Dynasty Tombs. Despite winning approval from premier Zhou Enlai, archaeologists vetoed the plan because of the importance and public profile of Chang Ling. Instead, they selected Ding Ling, the third largest of the Ming Tombs, as a trial site in preparation for the excavation of Chang Ling. With the excavation completed in 1957, the government established a museum on the site in 1959. The excavation revealed an intact tomb, with thousands of items of silk, textiles, wood, and porcelain, and the bodies of the Wanli Emperor and his two empresses. Neither the technology nor the resources to adequately preserve the excavated artifacts existed at that time. After several disastrous preservation attempts, the excavators simply piled the silk and other textiles recovered from the tomb into a storage room which leaked water and wind. As a result, most of the surviving artifacts have severely deteriorated, replicas taking their place on display in the museum. Furthermore, the political impetus behind the excavation created pressure to quickly complete the excavation. The haste meant that documentation of the excavation was poor. An even more severe problem soon befell the project when a series of political mass movements swept the country. That escalated into the Cultural Revolution in 1966. For the next ten years, all archaeological work stopped. Wu Han, one of the key advocates of the project, became one of the first major targets of the Cultural Revolution. He was denounced, dying in jail in 1969. Fervent Red Guards stormed the Ding Ling museum, dragging the remains of the Wanli Emperor and empresses to the front of the tomb, where they were posthumously "denounced" and burned. Many other artifacts were also destroyed. In 1979, after the death of Mao Zedong and the end of the Cultural Revolution, archaeological work resumed. Archaeologists who had survived the turmoil prepared an excavation report. The lessons learned from the Ding Ling excavation led to a new policy of the People's Republic of China government to excavate historical sites only for preservation. All proposals to open imperial tombs have been denied since Ding Ling, even when the tomb entrance had been accidentally opened, as was the case of the Qianling Mausoleum. The government abandoned the plan to use Ding Ling as a trial site for the excavation of Chang Ling. The Ming Xiaoling Mausoleum is the tomb of the Hongwu Emperor of the Ming Dynasty. It lies at the northern foot of Purple Mountain (Chinese: 紫金山; pinyin: Zĭjīn Shān; literally "Purple-Golden Mountain") in Nanjing, China. In 2003, UNESCO included Xiaoling Tomb in the Imperial Tombs of the Ming and Qing Dynasties World Heritage Site designation. Legend states that, to prevent robbery of the tomb, thirteen identical processions of funeral troops started from thirteen city gates to obscure the real burying site. The construction of the mausoleum began during the Ming Dynasty in 1381 C.E. and ended in 1405, employing 100,000 laborers and at an enormous cost. The original wall of the mausoleum measured more than 22.5 kilometers in length. The mausoleum was built under heavy guard of 5,000 military troops. The sacred way started from Sifangcheng (Rectangular city), a pavilion where a splendid carved stone stele in the memory of the Hongwu Emperor Zhu Yuanzhang stands, with a hymn inscribed by his fourth son. The top of the pavilion has been destroyed. 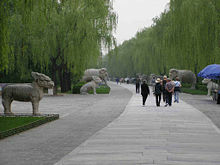 In the middle of the 1800 meter long winding sacred way, six kinds and twelve pairs of animals guard the tomb. Beyond them stands a pair of decorative columns called huabiao in Chinese. Four pairs of ministers and generals have been standing there for centuries to accompany His Majesty beneath. The local government in the Qing Dynasty (1644-1911) inscribed on a stone tablet outside of the gate of the mausoleum, an order to protect the tomb. Inside the gate, a pavilion hosts five steles. The Emperor Kangxi on his third inspection tour had the central stele inscribed with four Chinese characters. Behind the pavilion, other annexes had stood. Most of them collapsed, yielding relics that reveal original splendor of the dynasty. The emperor and his queen were buried in a clay vault, 400 meters in diameter. On a stone wall surrounding the vault, seven Chinese characters were inscribed, identifying the mausoleum of Emperor Ming Taizu (respected title of Emperor Zhu Yuanzhang). The mountain to the south of the tomb is the mausoleum of Sun Quan, King of the Kingdom of Wu in the Three Kingdoms period (220-265). The placement of that tomb forced the Sacred Way to bend. The Western Qing Tombs (Chinese: 清西陵; pinyin: Qing Xi líng; lit. Western Tombs of the Qing Dynasty) are located some 140 kilometers (87 miles) southwest of Beijing in Hebei province near the town of Yixian. The Western Qing Tombs constitutes a necropolis that incorporates four royal mausoleums where seventy-eight royal members have been buried. Those include four emperors of the Qing Dynasty and their empresses, imperial concubines, princes and princesses, as well as other royal servants. Emperor Yongzheng initiated construction of the Western Qing tombs, breaking with tradition by refused the play to bury him in the Eastern Qing Tombs. Yongzheng had usurped the throne by killing his brothers. He chose not to be buried alongside his father the Kangxi Emperor, relocating his tomb to the Western Qing tombs. Later his son, the Qianlong Emperor, decided he would be buried in the Eastern Qing tombs, dictating that burials should alternate between the eastern and western sites. The dictate had not been followed consistently. The first tomb, that of Tai Ling, was completed in 1737, two years after the Yongzheng reign. The last imperial interment was in 1998, when the ashes of Aisin Gioro Puyi, the last emperor, were interred. The Western Qing tombs offers have been less well known among the Ming Dynasty Tombs. The Chang Ling (tomb of the Jiaqing emperor) and Chong Ling (tomb of the Guangxu emperor) have been opened to the public. Zhaoling ("Luminous Tomb" or the "Northern Mausoleum") is the tomb of the second Qing emperor, Huang Taji, and his consorts. The tomb, located within Beiling Park, in the northern suburbs of Shenyang, draws a large number of visitors. The tomb complex took eight years to build (between 1643 and 1651) and has a row of animal statues leading to it. The Eastern Qing Tombs (Chinese: 清东陵; pinyin: Qīng dōnglíng), located 125 kilometers northwest of Beijing, stand as one of the finest and largest extant Mausoleum complexes in China. Altogether five emperors (Shunzhi, Kangxi, Qianlong, Xianfeng, and Tongzhi), fifteen empresses, 136 imperial concubines, three princes, and two princesses of the Qing Dynasty lay buried here. Surrounded by Changrui Mountain, Jinxing Mountain, Huanghua Mountain, and Yingfei Daoyang Mountain, the tombs cover eighty square kilometers. Xiaoling, the tomb of Emperor Shunzhi (1638-1661, the first Qing emperor to rule China), and the first to be buried there in 1663, sits at the center of Eastern Qing Tombs with Zhao Xiling (Empress Dowager of Emperor Shunzhi), Jingling (Emperor Kangxi), Huiling (Emperor Tongzhi) in east side and Yuling (Emperor Qianlong), Dingling (Emperor Xianfeng), Ding Dongling (Dowager Empress Cixi and Empress Ci'an) in west side. Jingling, the tomb of Emperor Kangxi, has a surprisingly modest presentation given that he has been considered China's greatest emperor by some historians. That modest presentation harmonized with his modest and humble demeanor. The sacred way leading to the tomb has an elegant five-arch bridge; the guardian figures stand forth on an unusual curve quite close to the tomb itself, more elaborately decorated than those at earlier tombs. Yuling, the tomb of Emperor Qianlong (the fourth emperor of the Qing Dynasty), is one of the most, if not the most, splendid royal tomb in China. Yuling has an impressive tomb chamber with a series of rooms separated by solid marble doors, with walls and arched ceilings engraved with Buddha figures including more than 30,000 words of Tibetan scripture. The three ton doors themselves have reliefs of bodhisattvas and the four protective kings usually found at temple entrances. Ding Dongling, the tomb of Empress Dowager Cixi who ruled China from behind a curtain for forty eight years, is worthy of mention. The main hall contains reproductions of pictures produced in 1903, by Cixi photo studio within the Summer Palace. Reminders of the Forbidden City, such as the terrace-corner spouts carved as water-loving dragons, fill the room. The interior has motifs strikingly painted in gold on dark wood, recalling the buildings where she spent her last years. The walls are made of carved and gilded brick, and superbly fearsome wooden dragons writhe down the columns. The three Imperial Tombs of the Qing Dynasty in Liaoning Province include the Yongling Tomb, the Fuling Tomb, and the Zhaoling Tomb, all built in the seventeenth century. Constructed for the founding emperors of the Qing Dynasty and their ancestors, the tombs follow the precepts of traditional Chinese geomancy and fengshui theory. They feature rich decoration of stone statues and carvings and tiles with dragon motifs, illustrating the development of the funerary architecture of the Qing Dynasty. The three tomb complexes, and their numerous edifices, combine traditions inherited from previous dynasties and new features of Manchu civilization. ↑ Fredric M. Kaplan, Julian M. Sobin, and Arne J. De Keijzer, The China Guidebook (Boston: Houghton Mifflin Co., 1986), 273. ↑ Susan Levitt, Taoist feng shui (Rochester, Vt: Destiny Books, 2000), 3. ↑ M.A. Aldrich, The Search for a Vanishing Beijing: A Guide to China's Capital Through the Ages (Hong Kong: Hong Kong University Press), 318. ↑ Nancy Shatzman Steinhardt, Chinese Architecture. The Culture and Civilization of China (New Haven: Yale University Press), 157. ↑ Alan Samagalski, Robert Strauss, and Michael Buckley, China, a Travel Survival Kit (South Yarra, Vic: Lonely Planet, 1988), 279. ↑ Beijing Touree, Eastern Qing Tombs. Retrieved October 9, 2008. ↑ UNESCO, Original Decision Document. Retrieved October 5, 2008. Aldrich, M. A. 2006. The Search for a Vanishing Beijing: A Guide to China's Capital Through the Ages. Hong Kong: Hong Kong University Press. ISBN 9789622097773. Guangyuan, Xu. 2005. Eastern Qing Tombs 清东陵 Beijing: Hydropower Press. ISBN 9787508427386. Kaplan, Fredric M., Arne J. De Keijzer, and Julian M. Sobin. 1985. The China Guidebook. Boston: Houghton Mifflin Co. ISBN 9780395377628. Levitt, Susan. 2000. Taoist Feng Shui. Rochester, Vt: Destiny Books. ISBN 9780892817238. Nan, Yue. 考古中国：清东陵地宫珍宝被盗记 Haikou: Hainan Press. ISBN 9787544317979. Steinhardt, Nancy Shatzman. 2002. Chinese Architecture. The Culture and Civilization of China. New Haven: Yale University Press. ISBN 9780300095593. Samagalski, Alan, Robert Strauss, and Michael Buckley. 1988. China, a Travel Survival Kit. South Yarra, Vic: Lonely Planet. ISBN 9780864420039. Imperial Tombs of the Ming and Qing Dynasties on the World Heritage Sites website. Advisory Body Evaluation (for the Liaoning Tombs, January 22, 2003). Original Decision Document (October 29, 2004 - see p. 38, 39). History of "Imperial Tombs of the Ming and Qing Dynasties"
This page was last modified on 28 February 2018, at 00:35.